Designed and manufactured by Canford, these mountable enclosures are intended to facilitate fast, easy and effective termination of up to eight SMPTE 311 infrastructure cables and eliminate the need for pre-terminated cable assemblies. 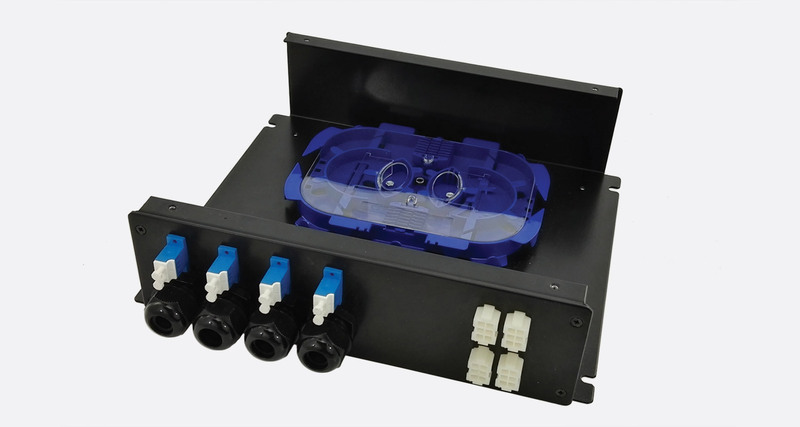 The enclosures are also ideally suited for applications where space or depth is an issue, as the units can easily be installed remotely from the SMPTE connection plate or panel if required. During installation the SMPTE cables enter the chassis via individual rear cable glands. The electrical elements are separated out and terminated using the male crimp contacts provided whilst the fibre elements are spliced on to the supplied ST, SC or LC tails using the incorporated splice tray. Once complete these are inserted into the rear of the respective MATE-N-LOK sockets and fibre couplers mounted on the front panel. Suitably terminated SMPTE connectors, which are available from Canford, can then simply be plugged into the available ports to complete the installation. These enclosures not only offer a true 'plug and play' approach but also significantly improve the process of on-site maintenance as it allows for defective connectors to be easily removed and replaced reducing down time and the need for expensive field service repairs. In addition to offering excellent protection to the internal splicing and components these units are fitted with a shroud above the front panel to reduce the risk of accidental damage to the external connections where exposed. This can be removed if not required. The enclosures are available finished in either Dawn Grey (BS48000-10A03) or Black. All of the required fibre patch cords, electrical crimp contacts and splice protector sleeves are supplied with the unit.